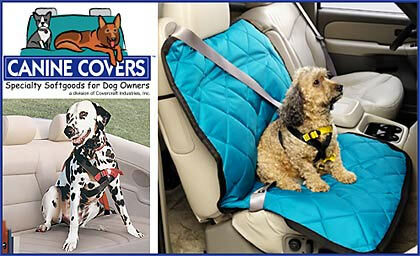 Covers offers a unique line of products to make the car ride pleasant for you and your canine pal by offering comfort for your dog and protection for the interior of your car! In 1965, Bob Lichtmann opened Covercraft for business in Southern California's San Fernando Valley. At that time, it was just a two-man operation, manufacturing custom-patterned car covers for street rods, the import sports car market and aftermarket automotive parts suppliers. During their first 40 years, Covercraft grew to a team of over 400 employees and expanded into three manufacturing locations, with headquarters in historic Paul's Valley, 60 miles south of Oklahoma City. The Canine Covers division was added in 2004 because it was a natural addition to the vehicle protective products we manufacture. People love their dogs and we've always catered to people who love their cars, so Canine Covers is a kind of "best of both worlds" program for people who travel with their canine companions. The company is certified to both TS16949: 2002, a worldwide quality system standard, and ISO 14001, an environmental quality program. Still family-owned, Covercraft has always maintained the highest standards, utilized the finest materials and remained on the cutting edge of manufacturing technology...but it's our people who assure we put "Cover craftsmanship" into everything we build! If your dog is lucky enough to travel in the back of an SUV or wagon this product will assure the trip is made in comfort. Our cargo area dog bed provides a quilted, breathable comfortable surface so your dog won't get too hot or cold. It's built strong enough to handle multiple dogs and can be removed for easy cleaning. These Products Sound Great! How Do I Order? Just visit our website. Go to the page for the product you are interested in and when you click on the "buy" button you'll be asked to provide make, year and model information about your vehicle to determine which pattern fits your application. For Semi-Custom and Universal seat protectors visit our "dimensions" page and use the measurements of your seat to determine the correct cover. Order Your Canine Covers Accessories Today! Protect your puppy and your vehicle with our line of dog cover accessories! Whatever your needs our, we can meet them. Don't wait - order today!